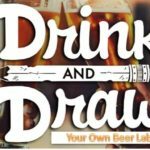 Design Beer Labels: Drink & Draw - Next Door Brewing Co.
Come drink and draw/design beer labels with us during Madison Craft Beer Week. Bring your creative or lack of skills (both are fine) and enjoy a night of great craft beer and fun artwork. We will provide topics and name of beers and you get to create some easy, simple and fun artwork that you think would be an awesome beer label. All artwork will be hung and displayed at the brewery. Who knows, we might just use your ideas on a future beer label. All the topics / materials needed with be provided by us so just grab your friends and show up for some fun and cold brews.